There is seemingly a never ending parade of new strains of Saccharomyces, and the last few years Brettanomyces, being released on a consistent basis to both the professional and home brewing world. But the diversity of Lactobacillus species on the market has been sparse to say the least. As sour wort\kettle souring with pure culture strains of Lactobacillus has become even more popular, folks (myself) have been looking for some different cultures other than Delbrueckii and Buchneri which White Labs and Wyeast have carried for years. Especially with the White Labs L. Delbrueckii culture having a reputation of being cross contaminated with cells of Saccharomyces resulting in very little lactic acid in finished beers. Labs like Omega and Gigayeast have stepped to the fore with some great blends of various Lactobacillus Species but after reading Matt Humbard's comprehensive research on Lactobacillus I was really interested to try some them on their lonesome. The species that stood out the most to me from Matt's article was Lactobacillus Plantarum. It has a few redeeming qualities that I have been searching for, its Homofermentative, acidifies very quickly and does not seem to need a ton of heat to achieve that acidity. Make sure you read through his article as I couldn't do half as good a job as describing L. Plantarum, among other species, as he can. 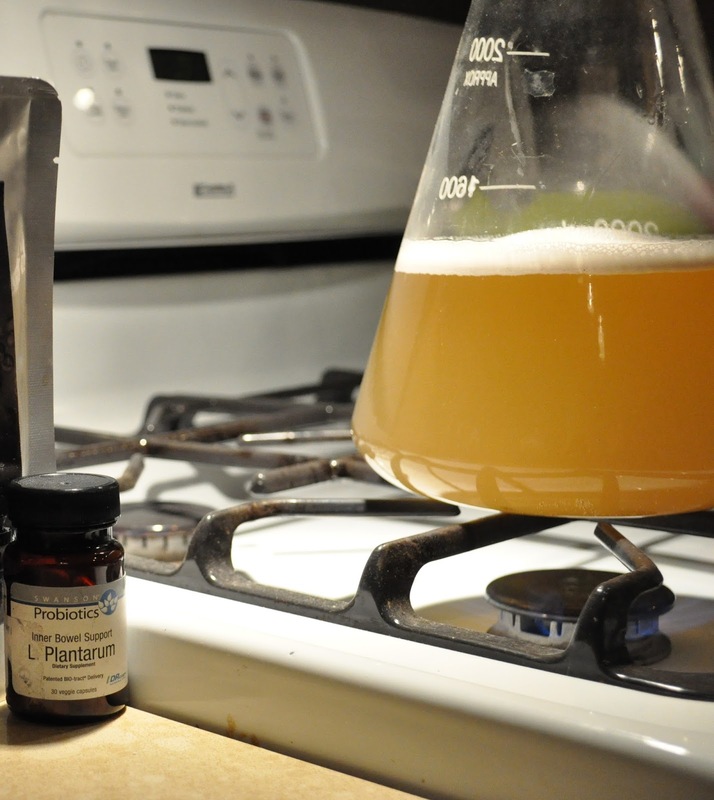 I couldn't locate any labs that sold a pure culture Homebrew sized pitch of L. Plantarum, although there may be for pro brewers. After chatting with some folks on Milk the Funk I came across these Probiotics from Swanson. Each capsule is reported to have 10 billion cells of dry L. Plantarum and at that price its hard to beat, so I figured they were worth the try. Using the same short brewday sour wort method, and recipe as in the previous post, I brewed up another Gose for further summer enjoyment. I cracked open 3 of the capsules of the Swansons L. Plantarum and got them into 750ml of starter wort, left unstirred and held at 105F for 36 hours. The starter reached a pH of 3.3 in that time, then the whole starter was pitched into 100F wort in a Better Bottle. I held the sour wort at only 95F, since I read Plantarum can acidify a little cooler than other species. After 48 hours of sour worting the pH was 3.31 and it was very tart, I made the mistake of not taking a gravity reading here but have on more recent batches and the gravity drop has been minimal. I pitched some US-05 and fermentation was done about 48 hours later (4 days total) at 1.003 and 3.31pH, the beer was kegged on the 12th day of fermentation. This batch was 5 IBUs and L. Plantarum had no problem at all acidifying the beer quickly. In recent batches I have used 8 IBUs and 10IBUs (calculated) reaching pH levels of 3.35 and 3.40 respectively. I plan to test it out at some high IBU concentrations but it's looking like a fairly IBU tolerant strain that suits my boiled, hopped, sour worted method. I will update later on in the summer after I play with some high IBU worts and how L. Plantarum worked. Below are tasting notes for this batch, recipe after the notes. Nobody Gose there anymore, it's too crowded: with Probiotics. But do you Milk the Funk? Appearance: The beer is almost white in color, the photo doesn't do the color justice, extremely pale and hazy. Soapy bright white head, it fades but not as fast as you might think, and there is a decent ring of head that hangs on top the entire glass. Usually head retention in these beers are awful due to the low pH, not in this beer and not in any of my sour worting beers. Not sure why that is, I guess I'm doing something right. Aroma: Raw malt aromas, like sticking your face in a bag of Pilsner. Slightly bready, a bit rustic, lemony and and noticeably acidic. A bit of funk and spice from the coriander, some Belgian-esque esters that I wasn't expecting. Taste: Acid upfront as expected, prickly as it crosses the tongue due to the acidity and some carbonic acid but this isn't a highly carbonated beer. Cleanly lactic, subtle Belgian-esque spice following the nose, maybe that's the coriander though. The salinity is very low, and finish is dry and acidic with a slight pucker in the back corners of my mouth. Overall: Very refreshing summer crusher, as compared to the last batch it's more sour and light on the salt and coriander character but I dig it. It has a really nice grainy character, like uncrushed raw malt, it's dry and perfect acidity wise, for what I want not as a classic example. The ease of these L. plantarum tabs make this a real winner for me. I'm wondering it the Lacto added the raw character to the beer, maybe the esters as well. I most certainly use these tabs again, I may use them blended with other species of Lacto like Omega does with their blend but just to see how things differ. Its a great cheap source of aggressive Lacto that's readily available to anyone. Multiple fermentations in the dark. 5ml lactic acid in the mash, Mash ph 5.35. Thanks for the write up ed. Always enjoy reading what you've been able to find / figure out. I just want a repeatable method, to make these lacto beers, in a simple way. It seems like these probiotics might be a reasonable option as a lacto source. I'm now trying to iron out some of the other variables that have been problematic for me. Reading your short boil method raises some questions for me. For me, I'd a bit worried about DMS production, but I tend to use Pils with my Berliners & Goses. Are you picking up any DMS? I don't have any specific off flavor testing experience, so I can't tell if some of the aromas I'm getting are DMS or just a normal lacto byproduct. My other question is what have you found for head retention. My no boil, brevis, then s-05 method while makes a good tasting beer, head is nonexistant. 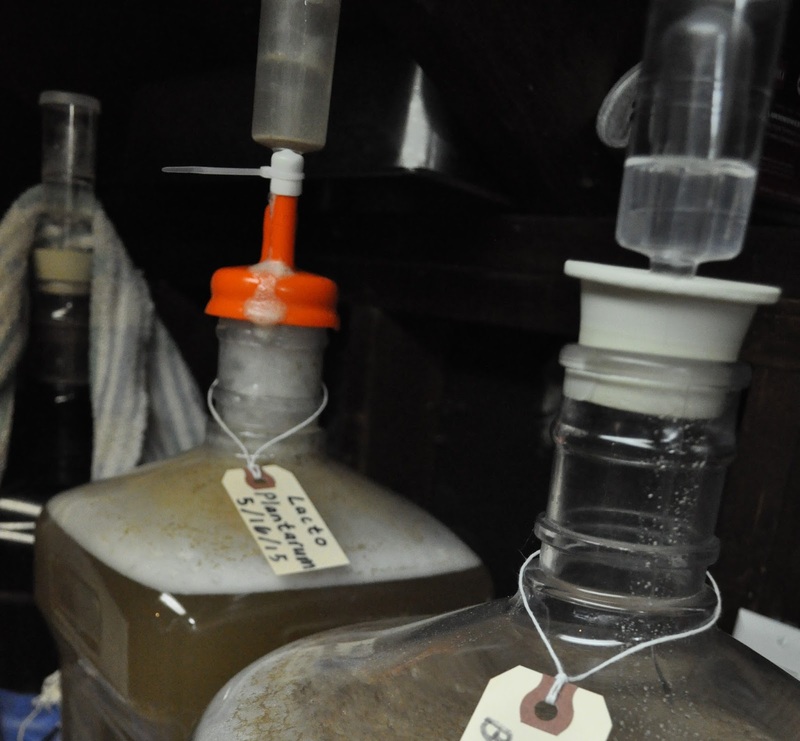 I understand acidifying before fermentation can help, but w/out a ph meter, i'd be shooting in the dark. Thanks for the kind words Aaron. I really think these probiotics are a great inexpensive reliable source of Lacto for consistent results. I completely understand the concerns about DMS, its a concern of mine as well but after 8+ batches using this menthod I have not had an issue yet. Not to say it wont happen but so far things have been fine, and I know others who use a similar method. But I really should research it a bit more and see if I am just getting lucky or what. My beer pH going into the fermenter is always about 4.7 or lower after I add salts and lactic acid during the mash. Its possible by hitting that number is good enough to retain some head retention. I have just never had the issue that others have had with these beers. Its something we all need to learn a bit more about. Yea I am not a fan at all of sour mashing either Chris, or acidifying using grains. The grains can work but its much more of a crapshoot like Aaron said. Ive been working on an acid beer using Jeff's method as well. Perfect for blending a bunch of funky weird beers. 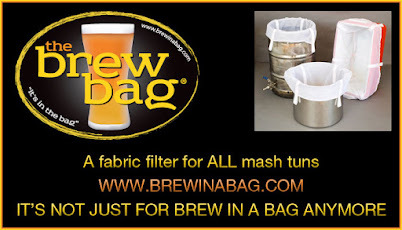 Mixed Fermentation beers really need to be blended imo, its so hard to nail them without it. I absolutely plan to get my hands on some L. Plantarum to use for some fun BW experimentation I have planned. Great article, Ed! Thanks Marshall, looking forward to see how they work out for you! Cheers. Great write-up, Ed, thanks for doing that! Probiotic capsules never even crossed my mind; being a pharmacist, I'm more than a little embarrassed to admit it! Thanks Shawn! I took the idea from someone else of course, can't believe I didnt think of it either. Should we be aerating before pitching the yeast after the lacto has done its job? Came here to ask the same question! Ed, I would assume drop to ~68, then aerate and pitch? How have you been doing it? I aerate a little, I know real exact, I just shake the carboy for 20-30 seconds after I pitch the secondary strain. It works perfectly fine but mostly its because I try to keep my o2 stone away from a beer filled with bacteria. Hey Ben, sounds super awesome, I would love to try them. Never take for granted the importance of getting enough sleep and rest to have a healthy and longer life.